I'm busy recently. But I like it. Busy doing things you love will keep you healthy, as long as it not to much and tiring. I'm going to join my second bazaar with Angelica. Yes, Cataliber is joining its second bazaar! We preparing all the materials we need about one month. Chop chop! We are in a rush. I hope all is well. 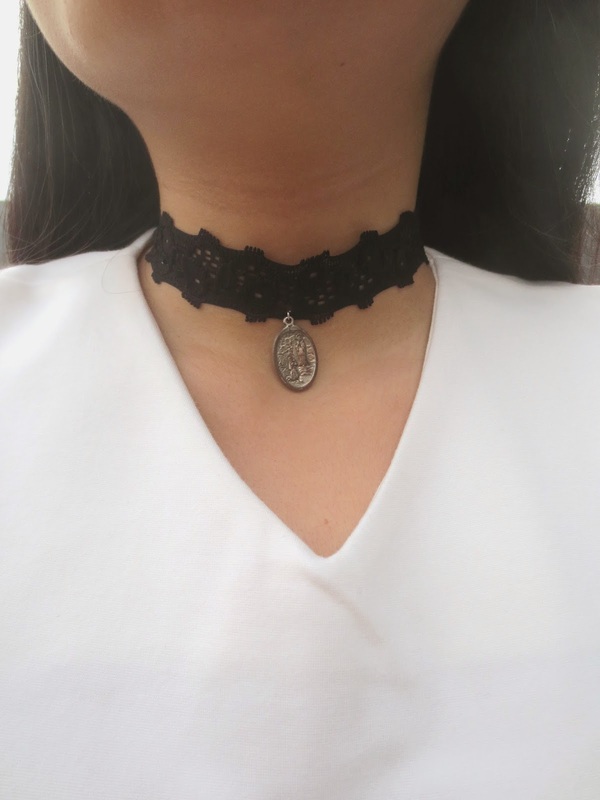 Anyway, I'm wearing St. Bernadette pendant choker from L.I.N.F by Liz Elizabeth. St. Bernadette is my guardian angel, my baptist name is Bernadetha. I found this very old pendant in mama's jewelry box a couple of years ago. I have no idea where my mom got it and why she never use it as a pendant on her necklace. It saves perfectly in her jewelry box. I asked Liz, my blogger mate, to make a choker special for me with this pendant. And voila. I love the result! It suits me well, isn't it? This skirt is a new collection from BENASH. I paired it with white top and silver shoes from Vroka Footwear as the final touch. simple but elegant sepatuuu nya mauuu kak !!! sepatunya pengen gw copot bawa kabur.. hahha..
such a babe as always! lovin' the cut&style of the skirt, very unique and cool. Oh I love chokers and yours is so delicate and pretty! 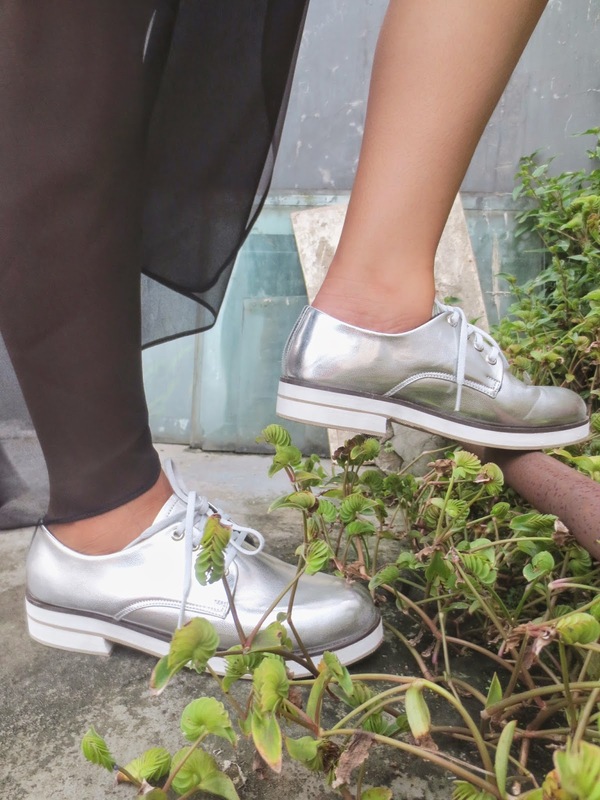 The silver shoes are extremely rad ^_^ Gotta get me a pair of those! I'm in love with your choker! love the skirt and that shoes is so cool ! Great look, love the silver shoes! Okay you are so stylish!! 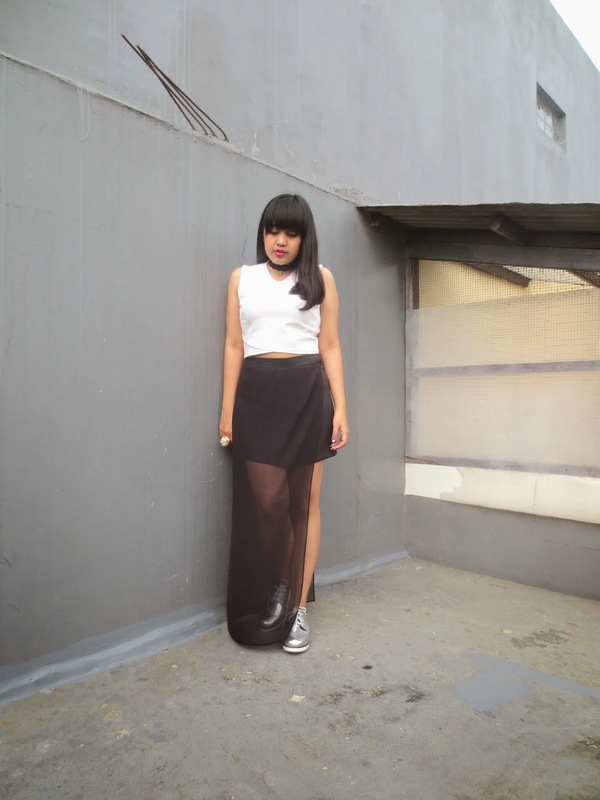 The sheer panel asymmetric skirt is mega cool, I want it!! Glad I clicked on your comment on ATLANTIC PACIFIC's blog and got led back here to yours. 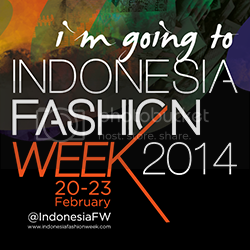 Your blog's pics and layouts are great too, keep it up! Just followed on GFC and bloglovin' <3 By the way, I just bought the CHANEL GRAFFITI BOY BAG from the S/S14 RUNWAY SHOW, it's my newest favorite statement bag, please tell me what you think of it! That skirt and shoes is love! Those shoes got me drooling! PearlofmyEye.com <-- GIVEAWAY on NOW!